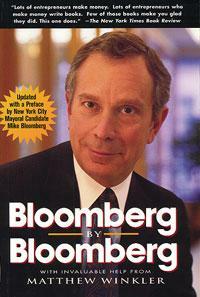 Click here for 4 full quotes from Mike Bloomberg in the book "Bloomberg by Bloomberg," by Mike Bloomberg. This book was supposed to be Bloomberg's autobiography in preparation for his presidential run � published in January 2019, which was just the right timing to get started in the Democratic primaries � but then he withdrew from the race in March 2019. OnTheIssues was disappointed, because we had invested a lot in covering his nascent candidacy, including this book! (In other words, we were surprised by his withdrawal). Bloomberg says he will spend millions on resisting President Trump and supporting his opponents candidacies and policies. That's probably a wise path for Bloomberg to pursue his interests, but this book prepares for the different path of a presidential candidacy, so we'll describe that path. Climate Change: Bloomberg has pushed for action on global warming (p. 223) and will presumably support Gov. Jay Inslee, who has declared climate change aa the focus of his presidential campaign. Public Health: Bloomberg most famously instituted a smoking ban in NYC (p. 227) but also worked on communicable diseases (pp. 179-80) � a different take than most Democrats who focus on health insurance and Medicaid. Corporate Reform: Bloomberg, despite his personal wealth, has a redistributionist philosophy (p. 236 and p. 187), and despite his corporate history, believes in corporate transparency (p. 62 and p. 157). This would have been Bloomberg's primary contrast with President Trump, who opposes redistribution and transparency. Alas, that contrast with President Trump will not happen, since the mainstream media won't report on Bloomberg now that he is out of the presidential race. But Bloomberg's ideas are worth a look anyway � he really does present an alternative way of looking at business than does Trump. That would have been an important contrast, since Democrats will otherwise continue along the path of fighting corporations instead of using corporations to work towards more progressive policies, as Bloomberg has. The political pundits obsess over whether Bloomberg's withdrawal opens a "wealthy businessman lane" for fellow billionaire Howard Schultz (it does not; Bloomberg got elected as mayor and planned to run as a Democrat, while Schultz never did either); or a "centrist lane" for Joe Biden (it does not; Biden is a liberal while Bloomberg leans progressive, but the mainstream media doesn't know how to make that distinction). Bottom line: when you hear discussions about "lanes," it's best to change the channel because using the term "lane" means the pundits speaking have not bothered to understand the issues. Or better yet, turn off the TV and go read OnTheIssues, so you can understand the issues better than the "lane"-blathering pundits. Given $10M upon being fired from Salomon Brothers in 1981. Built up a $1.3B company from scratch over 20 years. Started Bloomberg company after Salomon Bros. fired him. Publicity helps business, but it's best to say it yourself. The above quotations are from Bloomberg by Bloomberg, by Mike Bloomberg.